Sarah Leary, MD, is attending physician at Seattle Children’s Hospital and Assistant Professor in the Division of Pediatric Hematology/Oncology at the University of Washington School of Medicine. 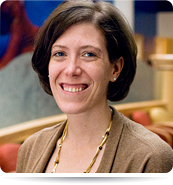 Her clinical and research focus is in the area of pediatric brain tumors. The goal of her clinical and translational research is to improve outcomes for brain tumor patients by developing biologically targeted therapeutics. SL: I always liked the combination of science and service in the profession of medicine. Being a doctor means helping people on a day-to-day basis and doing research means helping people in the future. SL: I have had, and still have, several important mentors. When asked how she chose her career path, one of my mentors told me that she just picked an important problem and then went to the best places in the world to learn how to solve that problem, which is what I’ve tried to do with my career. My mentors have also helped me by the examples of how they balance their careers with their families and life outside of the lab or hospital. SL: My undergraduate major was in biology with a minor in chemistry, and I also studied psychology. My background in science helped me approach medicine from a scientific point of view. In addition, being part of the college rowing team challenged me to work on teamwork, time management and perseverance, which are essential skills in medical school and life. AK: Where did you attend medical school? SL: In Memphis, Tennessee, at the University of Tennessee College of Medicine. AK: How did you become interested in pediatric brain tumor research? SL: I first learned about the problems of brain tumor patients when I was doing my subspecialty training taking care of patients in pediatric oncology, and then decided to work in an exciting lab studying one rare type of brain tumor in depth using patient tissue samples collected from all over the world and a technology using small “chips” (about the size of a phone battery) that are able to test nearly all the genetic information in a tumor overnight. I was overwhelmed by how much there is to learn as well as the potential to make a difference, and this made me want to dedicate my career to the problem of pediatric brain tumors. SL: I work with the laboratory of Dr. Jim Olson at the Fred Hutchinson Cancer Research Center in Seattle to study new treatments for pediatric brain tumors using tumor tissue which patients from all over the country donate for research at the time of surgery. I also work on patient trials of new treatments through several national and international organizations. Because pediatric brain tumors are rare, it is essential that investigators work together, which I really enjoy. AK: What is translational medicine? How can it help in the discovery of advances in the medical field? SL: To me, translational medicine means using scientific experiments to gain information which is most helpful for patient care, while at the same time using what we learn about patients and their diseases in the clinic to set up the best experiments. So the “translation” goes in both directions between the lab and the clinic. AK: What are your goals you hope to accomplish, both as a doctor and as a medical researcher? SL: As a doctor, I try to always have the best information and resources available for my patients and their families to ensure the child gets the best care possible. My goal as a researcher is to improve survival for patients with brain tumors by developing new and better treatments. SL: I think vaccinations are medicine’s greatest invention so far, in that they have saved more lives than any other invention by using the body’s own immune system to prevent deadly infections as well as some cancers. In the future, I hope we can use the immune system to fight cancer after it has already developed. SL: One of the best things about medicine and science is that it is always changing, and there is always something new and exciting to learn. I would encourage anyone interested in medicine or science to keep studying and ask lots of questions, because the more you learn, the more fun and interesting things get! Thank you, Dr. Leary, for your participation in our Amazing Mentor! Spotlight interview! I know our readers who dream of becoming a doctor or researcher will learn a lot and be inspired by your interview! Kindest regards, Alyse Rome, Founder/President, Amazing Kids!